So many games, so little time… to review them all! Yes, the past couple of months have seen a flurry of new games enter the Dice Hate Me library and, subsequently, our gaming table. I’ll be ramping up the review schedule a bit this summer, but cranking out two or three reviews a week right now is just not a practical goal. And, so, I offer up the next best thing: some brief impressions on a notable few that we’ve encountered, many of which will be getting the full Dice Hate Me treatment in the weeks ahead. In this hybrid co-op, you and up to five other brave souls must defend the castle against a relentless, marauding band of orcs, goblins and trolls. Some turns, all seems quiet while some doddering goblin comes stumbling out, only to be taken down by throwing a rock at his head. Other turns, a horde of seven or eight meanies may bear down on you, and all you have to show for it is a hand full of nothing. Sound challenging? It is. Sort of. Monkey238 and I had a few tough scrapes, but ultimately had little trouble weathering and winning our first battle. The same goes for the solo missions I attempted. Luckily, the rule book comes with a lot of interesting ways to mix up the gameplay and ratchet up the difficulty. This may not be the game for those that love to play Pandemic on Heroic, but for most it will be a fun diversion, especially for younger slayers. I have a secret: I’m nuts about zeppelins. For over four months, a copy of Airships sat on the shelf of my local game store; every time I’d go in, the zeppelins would call to me and I’d pick it up, look at the pretty pictures, flip the game over, see lots of dice… and promptly set it back on the shelf. But there is only so long that a fear of dice can overcome a love of zeppelins, and so Airships finally joined the library. I am so glad that it did. In the game, you play an entrepreneur, hoping to become the next king of the air. The scads of dice represent resources that are used and rolled in order to obtain better technology, or captains, or engineers – all of which help your dice pool and your chances of building bigger and better airships. If you can successfully manage your cards and dice, you’ll get a chance to build part of the famed Hindenburg, netting even more points. The theme is fun, the gameplay quick and easy to learn, and the choices seem just right for a light Euro-style diversion – with dice, no less! Look for more on this one in a larger review on Dice Hate Me. A lot of gamers underestimate card games, and often rightly so. They’re typically cheap to produce, and many of them have the same tired mechanics of scores of their predecessors. However, every now and then, a card game comes along that transcends the masses. No Thanks! is just such a game. Skillfully blending luck, tactical thinking and press-your-luck gameplay, No Thanks! is about as simple as it gets. Each turn a single card is turned over from the 33-card deck. On the face of the card will be a number from 3 to 35. These numbers are worth points at the end of the game, but the trick is that you want the least amount of points when the deck runs out. 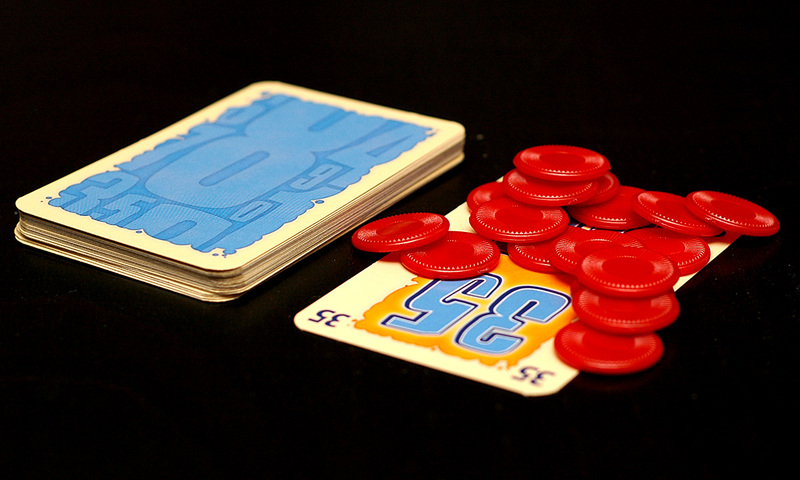 Players are also provided with 11 plastic chips at the start. 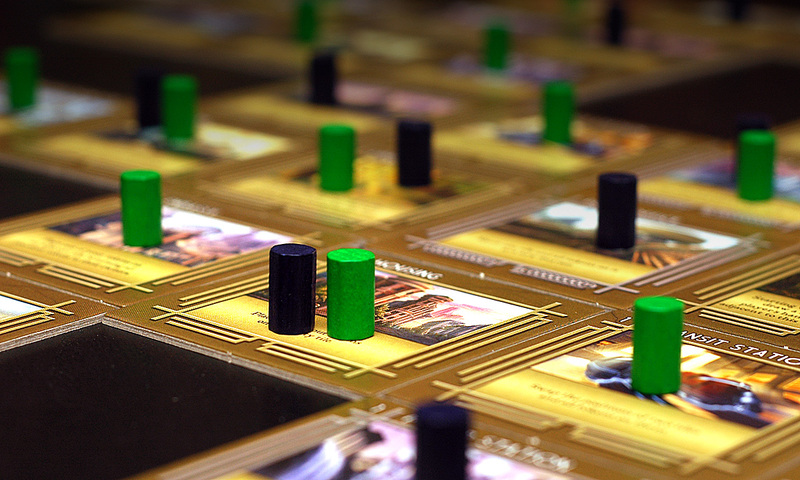 These chips are worth negative points at the end, and they also allow players to pass on a card when it is flipped over, plus a player gets all the chips on a card when they take it. To sweeten the pot, and ratchet up the tension, players can take cards in an effort to form a sequential chain of numbers, the lowest of which is the only card that counts in scoring at the end of the game. Oh, did I forget to mention that nine cards are removed from the deck at the beginning of the game, making sure that players have no idea if they can actually form a sequential chain? Oh, the joy of seeing someone take a 35 and a 33 after scads of chips have piled onto them, only to find out that the 34 is not in the deck – unless, of course, that player happens to be you. Fast, fun, and an instant classic. Get it. Get it now. I’m just going to come right out and say it: thank you, Stronghold Games. Thank you for realizing the potential in a classic out-of-print game from the 1980s. Thank you for treating it with reverence, and for taking the time to create quality components and adding to already-compelling gameplay. And thank you most of all for helping so many gamers realize that it’s ok to feed your mom to hungry sharks just so you can swim to safety from a sinking island. Yes, Survive! is back, and it has rekindled the love of the reciprocal backstab. Expect this one to get the full Dice Hate Me review treatment very soon, but for now, both Monkey238 and I can safely say that this may be the most fun we’ve had playing a game all year. See why it's called "Infinite City?" I was lucky enough to pick up Infinite City on the cheap in an auction at MACE West, and the jury is still out on whether that was a good thing or not. The art and components are superb, and I generally love creating a sprawling gamescape from hefty cardboard tiles, but much of the gameplay in Infinite City seemed lacking. The overall goal of the game is to accumulate points by careful placement of tiles and wooden ownership markers. 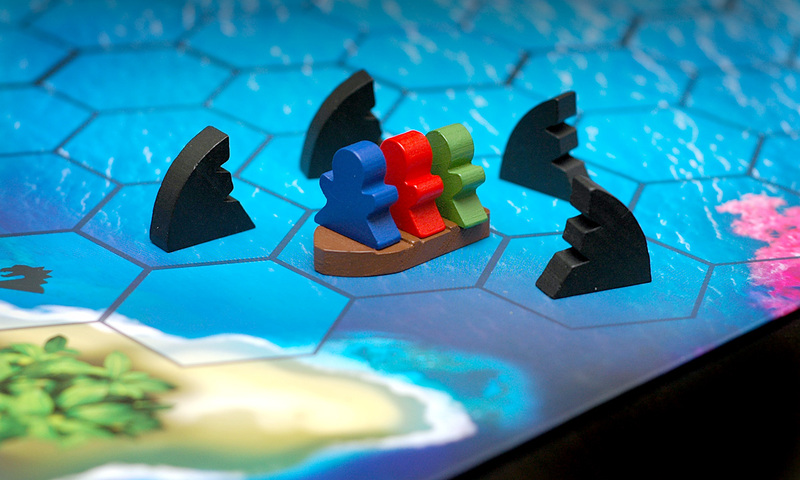 Each tile has a special ability that can allow you to do things such as swap out tiles, remove players’ ownership markers, or increase your victory points, provided you can maintain ownership to the end. The theme, structure and enticement of both luck and tactics are all there, but the game is devoid of… well, joy, for lack of a more suitable term. Infinite City seems to be one of those games that is more enjoyable with more than two players, and I plan to withhold final judgment until I can get this on the table with a larger group. Hopefully we can get our city-building, tile-laying fix from the upcoming Sunrise City, of which I’ll soon have a prototype in my hands! Every now and then Hollywood will go on a tear, and two or three blockbusters will open up around the same time with the same themes of deep sea exploration, or the earth getting blowed up by an asteroid. The board game equivalent of the giant asteroid flick phenomenon would likely be two games about classical painting. But is the board game world big enough to handle two games that are all about mixing colors and brandishing a brush? If it can deal with 30+ Munchkin expansions, getting some art education should be no problem. I think. At any rate, Pastiche and Fresco may throw around themes within the same realm, but comparing gameplay is like comparing crimson to tangerine. Both are incredibly enjoyable, but for wildly different reasons. Fresco’s color-mixing is much simpler, but managing worker placement and interacting with your opponents (ie. punking your neighbor) is highly emphasized. Pastiche is much more a solo affair – color matching is more diverse and tactically-oriented, but each player is pretty much in “the zone,” painting their commissions until someone yells bingo. These two wonderful games deserve a deeper look, so expect a special dual review on Dice Hate Me very soon. Along with the games mentioned above that will get a full review, all of you can expect even more in the next couple of months on Dice Hate Me. Be sure to watch for reviews of Legend of the Five Rings, Railways of the World, Road Kill Rally, Frag, The Awful Green Things from Outer Space, The Resistance, Ninjato, Saboteur, Train of Thought, and the much-anticipated (and oft-requested) Troyes. Thanks for reading! Remember, if you want to order any Eagle/Gryphon games – like Pastiche! – for a limited time, get 20% off any new order from Eagle Games through their website (free shipping if over $30). 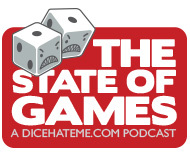 Just write “Dice Hate Me” in the comments/notes section of the order when you submit it. Who loves ya? I love Survive too! I’m glad you and Monkey had a chance to play it with me the very first time, and you fell in love with the game. Don’t forget to try that variation I mentioned in a two player game where each player controls 2 colors. It makes for a much more enjoyable 2 player game, otherwise you might find playing it the regular rules way will quickly disappoint you for 2 player games only. Otherwise, it’s solid! I have to admit I like both Fresco and Pastiche, although I think Fresco rates a little higher on my scale then Pastiche. 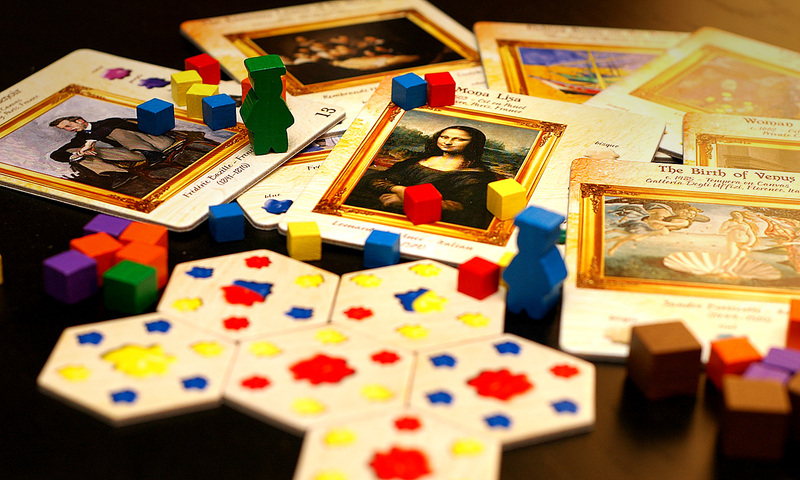 Don’t get me wrong, they are both great games, but Fresco has a lot more going on, and I love Meeples! I never played Airships, but I will have to take a look at some videos online as well as maybe see the rules online…would you recommend buying this one, or play it if someone else owns it only? I don’t like to invest a lot of money and then have games sit. Currently I have several at my house that are like that, and they are possibly going into the trade bin soon on the geek if they don’t get some game play. Part of my problem is the only people I get to play these games with is the Hypermind Gang and people like yourself and Monkey at gaming parties like Tom had for us all! I wish my wife would play more games, but it’s just not her thing. Also, I wish I could talk some of the gamers from Hypermind in to playing a few more times during the month, like on the weekend or some other night besides our regular Tuesday evening. Heck, I’ll even host them at my house if they are looking for a place outside of the store. Thanks for the quick overview in this post! Shawn – Thanks for the introduction to Survive! We love it, and I just introduced it to my coworkers today. We are going to take it over a dinner and small games party tomorrow night – they are a group of non-gamers who like to try games, sometimes. We’ll see how they like backstabbing. 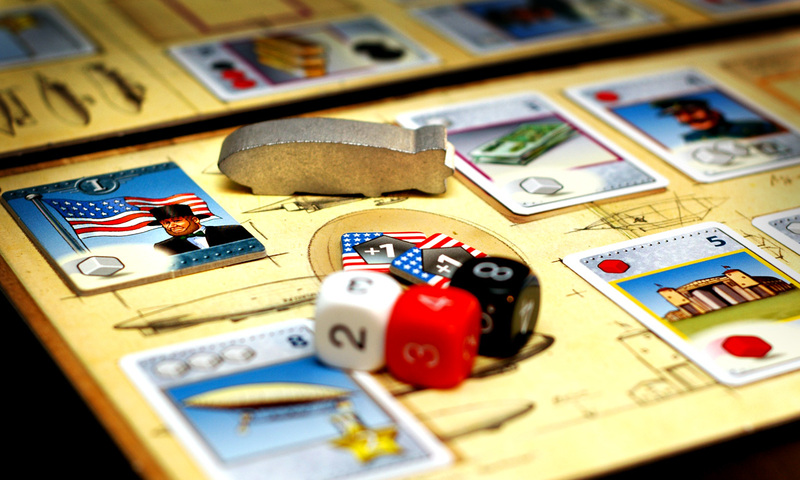 We are really loving Airships – it’s such a nice little filler. We’ve been playing it every night this week and it’s perfect for when you want just a taste of strategy and luck, without overtaxing your brain. I would suggest trying out someone else’s version first, though – it may not be your cup of tea. However, if you like euro style play with some neat dice mechanics, this one’s pretty cool. We will definitely get you to come over to our place soon for some games after you get back from Minnesota – and when Monkey is through with her schoolwork! Thanks for the impressions. I’ve wondered about Castle Panic. It seems like one that would be good for the family. We have Pandemic (which they like) and we LOVE Forbidden Island. I also recently picked up LOTR from GamerChris but we haven’t played it yet. So our co-op basket is probably full. It is good to see that I can mostly likely pass on Castle Panic. No Thanks! is just awesome. I can’t say enough good things about it. For my full review check out Go Forth And Game-Under The Microscope – No Thanks! (tomgurg.wordpress.com). Fresco is a good, fun euro that is on my buy list. I have heard good things about Pastiche from Shawn (above) so I’d like to try it. Airships was one I wondered about. I have heard negatives about it so it was good to heard that you like it. I’d like to try it soon. I’ll play Infinite City with you to get a three + game in. Tom – Thanks for stopping by. 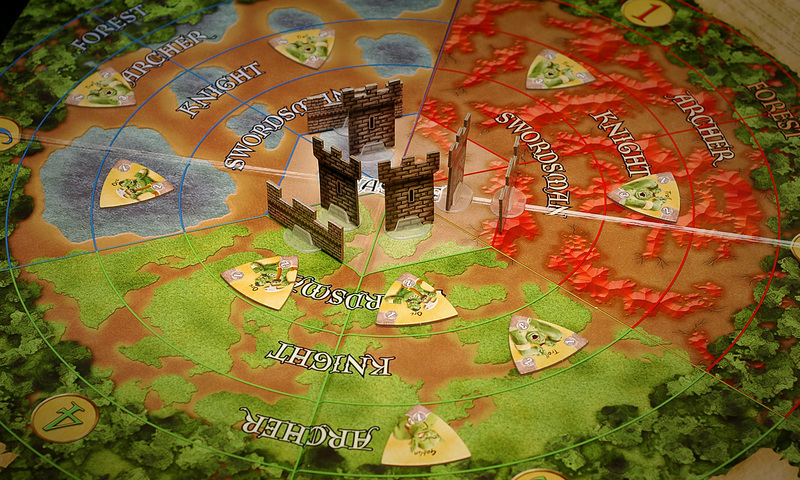 I think your family would like Castle Panic, actually. Feel free to borrow it any time you’d like just to give it a test spin. I wouldn’t recommend buying it, but you can at least have some fun with a community copy! I loved your No Thanks review – and you are the main reason I bought it. I’m so glad I did. It is an instant classic. We should definitely try Airships soon. It is really a lot of fun, and doesn’t require you to burn your entire brain in order to get anything out of it.